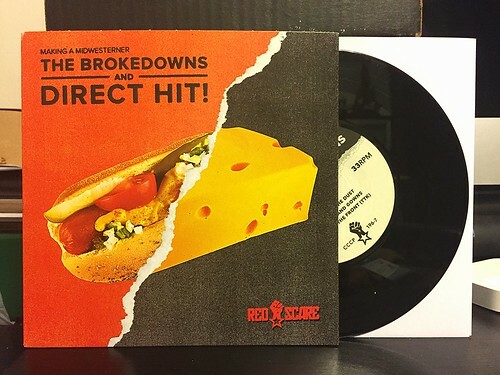 I Buy Way Too Many Records Dot Com: The Brokedowns / Direct Hit - Split 7"
I was sent this split 7" for review by Red Scare records. They've never sent me anything before and I'll have to admit, I wasn't all that familiar with either band before listening to this 7". Considering that the artwork struck me as being a little cheesy (ahem), I was actually pleasantly surprised that I ended up liking this as much as I did. We'll start with The Brokedowns, a band whose name I have certainly seen around a lot . Though, aside from a split 7" with Wide Angles that didn't really strike me as anything special, I haven't heard much by them. Their 3 songs on this 7" are all totally fine. They definitely have a midwestern punk vibe with vocals that have the same sort of urgency as the Paddy songs from Dillinger Four. The hooks are nowhere at the level of D4, but all three songs are totally serviceable fast, gruffy vocal punk rock. On the other side is Direct Hit. They're a band I don't really know anything about. Even though they sound eerily similar to The Brokedowns, they still manage to serve up two songs that are pretty good. While The Brokedowns probably hold the edge in vocals, Direct Hit had the advantage when it comes to big catchy choruses. Again, if you're into Dillinger Four or the mid 2000s No Idea records sort of bands, you may want to check these guys out. Maybe this record isn't a blow away must own, but all in all, it's a solid little split 7".